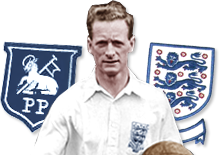 This site celebrates the life and career of one of English football's greatest and most legendary players, Sir Tom Finney. Sir Tom was a one-club man who spent his entire playing career with his home town team, Preston North End, scoring a record 187 goals in 433 games. Sir Tom was one of England's all-time great players, winning 76 caps and scoring 30 goals. Even after the end of his playing career, Sir Tom continued to be a fantastic ambassador for Preston North End and football in general.